With the 2400S Series, you benefit from owning a signal generator that achieves fast frequency switching and low phase noise simultaneously. The result is a reduction in test time, increased throughput, and an overall savings in test, evaluation, and production costs. The 2400S Series is capable of a switching frequency in less than 500 microseconds, making the 2400S ideal for test applications demanding high throughput, such as antenna characterization, T/R module evaluation, or RFIC manufacturing. In addition, the low phase noise of the 2400S makes it suitable for serving as a low jitter clock as well as a source for low noise frequency conversion. High output power and excellent spectral purity add to the standing of the 2400S as the best value in a general-purpose synthesized source. In addition, the 2400S models all include an option for Giga-tronics Automation Xpress Interface (AXI). The AXI, for use with Giga-tronics Automation Xpress software, enables 2.5 ms CW Frequency/Power switching, making the 2400S Series one of the fastest signal generators in its class. The optional Automation Xpress Interface provides faster data exchange and functional downloads/executions, as well as a stable API programming interface for the ATE programming environment. Compared to our predecessor and competition, we have reduced the number of buttons and LEDs by almost half and moved all I/O connectors to the rear panel, RF out excepted. By limiting the front panel to the control of basic parameters, our engineers were able to reduce the total number of soft screens and menus drastically. As a result, the 2400S Series is the most straightforward and easy to use signal generator available today. It takes much less time to learn how to operate the 2400S in a manual mode due to the reduction in complexity of the front panel, resulting in a reduced learning time. 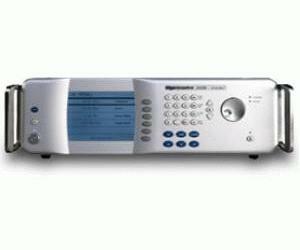 Every 2400S signal generator comes with Giga-tronics Automation Xpress, a PC based software package designed for enhanced user interface and automatic test systems. The Automation Xpress CD includes a full-featured plug-and-play driver and soft front panels to provide the ATE system integrator with everything needed to get up and running fast. A comprehensive LIST mode, Command-Line interpreter with script and loop capability, and GPIB traffic monitoring are just a few of the many features a test system programmer will appreciate when developing and debugging Test Program Sets. The 2400S Series offers tremendous value for a competitive price. The 2400S Series exceptional low phase noise comes standard with no hidden charges, and out performs all other leading suppliers standard phase noise. In addition, our harmonics are filtered throughout all of our frequency ranges, as opposed to filtering it just where it is easy to do, like the majority of signal generator suppliers have done. The new 2400S Series is designed for simplicity but with all the performance features one expects. Along with our innovative design, intuitive user interface, and Automation Xpress software, the 2400S Series is the most value-priced signal generator on the market.